A further development of the P-47 Thunderbolt concept featuring a new Pratt & Whitney R-4360 engine. Two prototypes built were tested in 1944–1945. Never entered service. 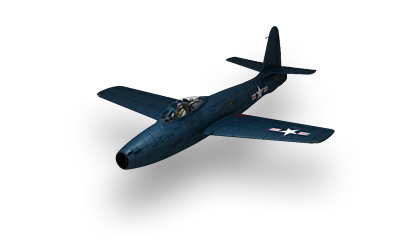 This plane is a modest upgrade from the P-47N, with slightly stronger rockets, somewhat stronger guns (though with two fewer of them), and slightly faster speed. Unfortunately, its enemies are significantly stronger, and usually have the altitude performance to keep up with you at any height. Therefore, you must be very careful when picking your fights. Lone bombers and attack aircraft are always a top priority. Don't be afraid to abuse your high roll rate to switch targets, since you probably won't get a second pass on them. Fully upgraded, this plane has a 20 second boost, and a 120 second reload on bombs and rockets. You should already have the 500 pound bombs from the XP-44. First, research the .50 M3 guns for a significant boost in firepower. Research the HVAR Mk. 25 next for more ordnance. Research all of the engines for better climb rate. Last, research the second airframe. This page was last modified on 23 February 2018, at 01:34.